Mr. Rex Murphy really got me thinking. I made my research and consequently, I wrote a book. In my research, I observed that through the years there has been a subtle shift in vocabulary within The Charter of Rights and Freedoms by our government which started in Hon. Pierre Trudeau era. Few have recognized it, yet it had a drastic effect within our society and even within the churches. It interferes and weakens our perception of how we can defend our constitutional rights. It is not of yesterday that the government use the tactic of redefining the word to accommodate their objective. Let me point out to you a report written in 1984 by the NHLRA (Newfoundland-Labrador Human Right Association). Notice the anomaly within the report. Have you noticed the sudden shift in vocabulary? These subtle shifts in the interpretation of terminology interfere and weaken our perception of how the Charter of Rights and Freedoms can defend us. The federal and provincial government established The Human Rights Commission institution to apply justice and equality under the guise of humanism, and not according to the Canadian Charter of Rights and Freedoms. It was a ruse to sneak into our school religious belief, moral values and ethical behaviours that went against Christian fundamental right. The 1984 NHLRA report was in direct conflict against The Charter of Rights and Freedoms which was written two years after The Charter was signed into law by Queen Elizabeth II of Canada on April 17, 1982, along with the rest of the Act. The Charter was preceded by the Canadian Bill of Rights, which was enacted in 1960. The NHLRA went beyond their mandate by discarding the Charter of Rights and Freedoms under the principality that every person is equal in dignity and rights disregarding religious rights not only toward Christians but also all religions. This report was a direct attack toward the Judeo-Christian culture in the province of Newfoundland and Labrador. The clergies also are in error of using these false twisted terminologies. I heard at the opening and closing prayers pastors giving thanks to God for the freedom to worship unaware that God has given them much more than simple right to worship in Canada. I believe that it is God who wrote the constitution for His behalf - for His purpose, not ours. He gave us, not the government the freedom of religion. The Constitution was founded upon the principles that recognize the supremacy of God and the rule of law. Not any gods, but the Christian God – the God of Abraham, Isaac and Jacob. The God who so loved the world that He gave His only begotten Son (Jesus), that whoever believes in Him should not perish but have everlasting life, Jn 3:16. (CONSTITUTION ACT, 1982 PART I). The Constitution of Canada was signed by Queen Elizabeth which holds the title of the 'Defender of the Faith and Supreme Governor of the Church of England’. What is the difference between freedom of worship and freedom of religion? The difference is that freedom of worship restricted Christians sphere of living according to your beliefs, ethics and moral standard values within the wall of a building, while the freedom of religion gives Christians the freedom to carry their right to beliefs, ethics and moral standard values everywhere in our society. It is our civil right. Have you not noticed how often we heard from the secular to keep our religion at church? It is a constant attack on our rights. Event Christian among themselves demanded not to mixed religion with politics… go figure. We have the fundamental right to peaceful assembly in a church environment and freedom of religion in a social environment. The NHLRA violated the rights of the Christian Faith religion in Newfoundland and Labrador under the guise of humanism, and that went on to every region in Canada. Since the Charter of Rights and Freedoms was a major obstacle to the certain liberal left globalist government elite, a scam, a scheme was created to weaken Christians influence. Yes, Christians were God’s light on the lampstand and the salt of the earth who had the mandate to protect Canada from autocratic political party or candidate. The elite, the so call well public influential and not so secret society made plan to silence the churches. They did it through the CRA – Tax Exemption. The churches accepted a pact with the devil. The churches agreed in exchange for Tax exemption to waive their right to take part in any partisan political activity which involves direct or indirect support of or opposition to, any political party or candidate for public office? Under the devil’s pact, a church’s denomination can not single out the voting pattern on an issue of anyone elected representative or political party? What does Jesus have to say about this pact? Since the shepherds were taking out of the way, the next agenda was to pave the way to weaken the Charter of Rights and Freedoms before it became into law in 1982. Prior to the Charter of Rights and Freedoms the Federal government under the Liberal leadership of Hon. Pierre Trudeau established in 1977 it ‘charter of rights and freedoms’ under a new institution, namely ‘The Human Right Commission’. You would probably believe that the Human Right Commission wound side with Judeo-Christian values, but aux-contrary, its sided with humanism philosophies founded by human ethical belief that we are all equal to our belief without God of the Bible in the picture, it will be utilized as the tools of reason, base on science and human logic when approaching problem-solving and constitutional decision making. What were the consequences? Christians were now vulnerable since the government through the Human Right Commission were making up the rules on our behalf without shepherds to defend them. Ultimately, Christian parent lost their parental sovereignty to the government who teaches religious values and sexual behaviours that go against Christians moral code. As I mentioned above, the Charter of Rights and Freedoms was written in a simple language for Canadian to understand. Therefore, the federal government turned and twisted the simplicity of the Charter of Rights and Freedoms into a complex and confusing vocabulary to persuade average Canadian to let THEM - the government take charge to define every aspect of the constitution, making it powerless for all Canadian. That is where and how The Canadian Christians lost Their influence. Christians cease shining their light on the lampstand. How does God view their arrogance of redefining HIS anointed LAW? The Charter is entrenched by LAW in the Constitution of Canada, therefore unmovable, as for The Canadian Human Rights Act, however, is simply a piece of federal legislation, which may be repealed or revised by a simple majority vote in the federal House of Commons. In simple language, the federal government installed a window blind in front of the Constitution so that average Canadian in particularly Christians wouldn’t have access to the light (the truth). From then on, it didn’t get any better. In 1996, for example, the Act was amended through the Human Right Commission to include sexual orientation as an enumerated ground of discrimination. As such, the Act now prohibits discrimination on the grounds of a person’s sexuality. 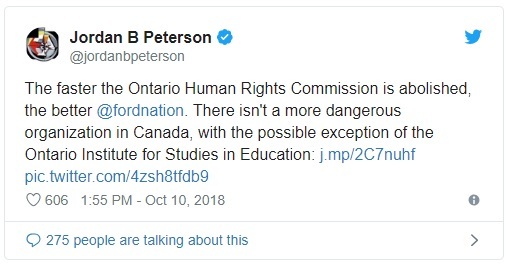 The sad result is that Christian parent, and all other parents of different religions, culture, tradition and moral values are powerless from the constant attack from the school boards all over Canada, supported by the Canadian Human Rights Act to teach sexual behaviours that go against parent’s consent. The government own our children – the United Nations own children through the Canadian International Development Agency (CIDA), as viewed in page ninety-nine of the NL Religious Education 1 - curriculum guide 2016. We individual Christian are responsible – you can’t put all the blame on our pastor although he will give account to God for leaving His sheep astray. Nowhere in the Constitution Act, 1982(1) SCHEDULE B, CONSTITUTION ACT, does the Canadian Charter of Right and Freedoms recognized the Canadian Human Rights Act. Canadian Human Rights Act is mention nowhere in the ‘Schedule to the Constitution Act, 1982, Modernization of the Constitution’. Therefore, since The Constitution of Canada is the supreme law of Canada, and any law legislated thereafter by the Canadian Human Rights Act is inconsistent with the provisions of the Constitution Act, it is to the extent of the inconsistency, of no force or effect. Canadian Christian parent has not only lost their parental sovereignty to an autocratic government, but also our national sovereignty to the United Nations. May God have mercy on us. All political parties are involved in the scheme. Therefore, the 2019 federal election won’t make a difference. And we can’t count on Section 59 of the Constitution which allows the Queen to annul the law. At the 1930 Imperial Conference, it was agreed that the United Kingdom would not reserve or disallow legislation without the approval of the Canadian cabinet. As long that The Prime Minister of Canada has the majority in the House of Common’s and that his Party Member’s of Parliament gives their full support, the Prime Minister of Canada reigns supreme. There is no stopping him, not even the Senate, as long as the partisan senators are in majority. The only obstacle that could have got in the way was the Canadian Charter of Rights and Freedoms. Yet, through time and multiple deceptions, the Charter of Rights and Freedoms has become a weak archaic document, unreachable for the average Canadian. A Charter made simple to read and to understand has become complicated, complex, elusive by the manipulation of a certain group of elites. I am a family man, with Christian’s beliefs which are viewed from outside the traditional Christian box. I am not a scholar, neither a theologist. Does this make any sense to you, readers? You are Christians. Too many Christians have given up - too many Christian parents are being challenged and persecuted by Schoolboards across Canada and from all provincial government. Too many Christians have been left astray by their own pastors and are found to fight alone without the financial resources to challenge their right to the Supreme Court of Canada since they must first appeal to an unconstitutional Provincial and Federal Human Right Commission. I am not here to make a name for myself. I am written to you just because I want to do what is right since I see no one in Canada from a Christian point of view who see what happened in the past fifty years. Am I too presumptuous? I recently published a book titled, “Canadian Christian Ministry 2018, The Most Lukewarm Church in the Whole Western Nations.” This book is meant to bring awareness to the churches and Christians that “WE” are responsible for letting the government teach our children values and religious belief that goes against our faith.